Apple is getting all festive with its giveaways over December and the New Year, with news that it is to bring back its 12 Days Of Christmas giveaway promotion. Beginning 26 December, Apple will be giving away a different free download every day. Apple is obviously being coy about what free stuff it will be giving away, but if it is anything like the last couple of years, then expect a few cheeky apps and songs. And this year there will be freebies available for the iPad, as well as the iPod touch and the iPhone. 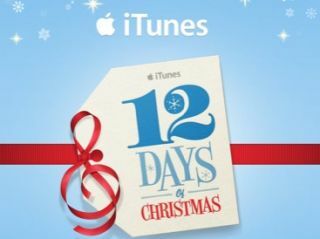 Over on the iTunes website Apple says about the promotion: "The 12 Days of Christmas app will allow you to download a free gift from iTunes every day from 26 December to 6 January direct from your iPad, iPhone or iPod touch. "Like the music, TV, iBooks, apps and films you receive? The app also offers recommendations of other content that you might like. "Download this free app now and be sure to turn on Push Notifications when prompted. You'll receive an alert every day when your new gift is available."